Halloween has snuck up and jumped me from behind. Several months ago I was visiting my friends at Kessingland Primary School near Lowestoft when I received an invitation to call on the librarian (oh, okay, Resource Centre manager) at the nearby secondary school, Pakefield High. It's a newly-built school and I was keen to visit as I knew that most of the Year Six children I'd met at Kessingland would be moving on to Pakefield. The school is still in a state of construction but the Resource Centre was impressive and there was a lovely buzz from the some of the younger students who were off to a poetry competition in Norwich the following day. AAAAAAAAAAAAAAAAAAGH! Yes! I am in ruins! I am terrified!!!! Serves me right of course. I've always loved my visits to Kessingland where we talk of books, boats and beaches and recently I've been contentedly running adventure story workshops in Essex primary schools. The Lion of Sole Bay is available as promised and, yes, it opens on the night of Halloween. It was a pragmatic choice, to some extent. I planned to write a story that had more than one point of view (there are three protagonists, Luke, Angel and Helen) and I wanted to hold them together in a reasonably short time-frame. That week which begins with Halloween runs through All Saints, All Souls, Bonfire Night and if it's just a little longer it extends to Remembrance Sunday. Usually it's also school half term which frees the kids to have Adventures. Either get rid of the parents (put one on a plane, drop a boat on another) or include them as manic, oppressive presences and you're away, you hope. 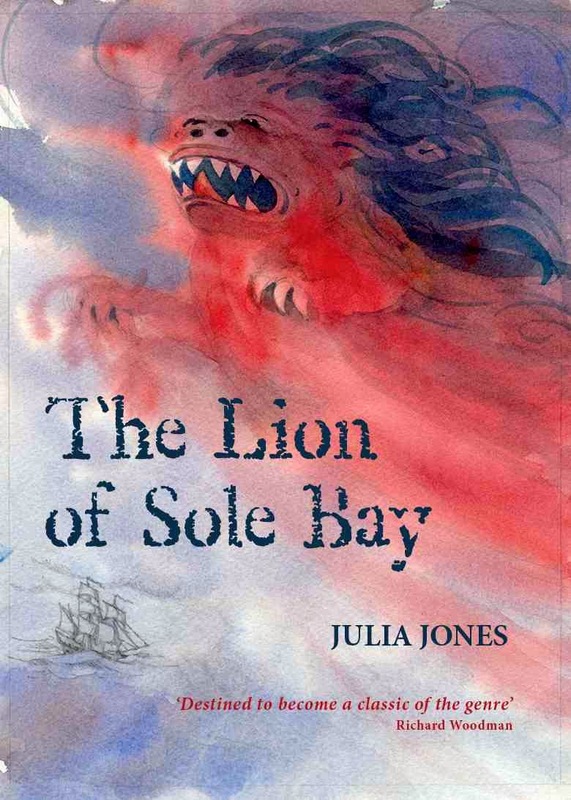 "A small witch fled into the night"
I've thoroughly enjoyed writing The Lion of Sole Bay. If it has any hidden agenda beyond providing young Luke with an adventure of his own, helping Angel make some friends and sending Helen back to the polder, it's an anti-violence, anti-superstition, learn-from-the-horrors-of-history novel. It isn't “a short spooky story” or “grim ghost-writing”. I hope my readers will feel tense, involved and excited – I don't anticipate sending them “to ruins”. I am beginning to wonder whether that the adventure story isn't the complete antithesis of the ghost story – and I wouldn't mind being talked out of this. It feels that characteristic posture for a ghost story protagonist is terrified helplessness.Those awful nightmares where you can neither move nor scream. Luke has a bad few hours hiding in the stuffy darkness of his sleeping bag, convinced that he has seen a werewolf but, come the dawn when “them dark spirits” have gone back underground, he laces up his trainers and sets off along the muddy path than leads past the sluice and round the top of the creek. He – and I – are back on track. I'm not a short story writer either. I read Kathleen Jones's recent blogpost "To Cut a Long Story Short" and all those knowledgeable comments had me nodding my head glumly. Yes, I believe short stories may very well be “the narrative equivalent of lyric poetry” (Lee) “a more difficult form than the novel” (Dennis) “virtuoso writing” (also Dennis) and conceived “in a different part of the brain” (Catherine). Unfortunately that's not what I do. I love plot and pace and spending weeks and months in the company of my characters. I like to think of them before I go to sleep each night and take them with me when I walk the dog in the mornings. I don't know Al, who made the comment that whenever she has a go at a short story it “threatens to turn into a novel”, but I suspect she may be a kindred spirit. Okay, so writing a short story would be a challenge – a new adventure even. I'll make that the 2014 resolution. Meanwhile, with children and young adults in mind, I've read Sue Price's Overheard in a Graveyard :Nine Haunting Stories (truly chilling) Dennis Hamley's Out of the Deep: Stories of the Supernatural (wonderfully explanatory) and have just bought a collection called Twisted Winter: Chilling Tales from the Darkest Nights. I deserve to be made to eat poison mushrooms for a month for not making clear that all the drawings in this piece are from the LSB and by wonderful illustrator Claudia Myatt. You could always turn it on its head and show them the other side, as you say- showing how lsb( which I'm half way through and loving) is using spooky differently, showing as you say the diff between adventure and spooky. Sounds like their day is over heavy on spook and they could do with some balance! I'll email you with a better explanation. Mainly though, don't fear, you have a great book, all kids will love. I think it's the best yet and that's high praise!! I'm sure you'll be fine - you seem to have loads of experience so you can use that to your advantage. Perhaps looking at what makes them jump, scared, worried would give them enough 'fodder' for their story and they'd be basing it on something they know (as the old saying goes write about what you know). I'm a great believer when doing a workshop in making the participants do all the work, so don't fret about the ability or otherwise to write short fiction. I know when I started writing novels I lost the ability to write short stories, although I had published several before expanding my horizons. I think it's a different skill, although some writers seem to manage to both. I think your project sounds fascinating, and as they say 'It'll be all right on the night'. 'Corraggio!' as they say over here. I know the feeling exactly - seems a good idea at the time ...... Then the grim reality hits! You will be fine. Spooky writing is just having adventures with spooks!!!! Good luck for Friday. Julia, a short story won't be 'short' to most of your group. It will be a long, hard piece of writing! They'll need guidance on how to build a framework - where should the story begin? What's the minimum that the reader needs to know? What scares them? - Something under the bed? In the dark of the bedroom cupboard? outside their bedroom door on the landing? - Or is 'scary' for them a dark, lonely street? What ending are they aiming for? - Everything spooky put to flight by bright light of day? Then how are the forces of Evil banished? - Or do they want the threat to linger - or to end with more dead than last act of Hamlet? What ever ending they want, how are they going to bring it about? I don't suppose for a second that I'm telling you anything you don't know! - But I've sometimes found it helpful to talk through things like this, just to bring it all to the forefront of my mind afresh. Sometimes the panic can make you forget everything! I think leading a writing workshop is a bit like teaching a child to ride a bike. That is, you can't really 'teach' in any meaningful sense. You can only run along beside them and encourage them until they find their own balance. Julia, you don't need to worry. I know I said (well, it was Jan Mark really) that the short story is 'virtuoso writing.' But that was at her level, not the kids'. Sue is right to say that writing a short story is a long, hard prospect for the kids, more forbidding even than a novel is to us. And Sole Bay, which I've now got and have started, so much thanks, really does have a frisson which would work with kids at Hallowe'en. Have a look at Helen's lovely short story about the gymnastic revenant which I quoted in my ghost story session on Edebookfest. If you can't find it now, I'll send it to you. Very short, one central event, complete in itself though leaving many questions, not creepy but with the true ghost story smack. Its structure is so clear and right, yet she would say, and I would agree, that the form wrote itself and the characters followed. And I didn't have to teach her that in some sort of lit crit task. Once she got the point the story nearly wrote itself. Nick's account of the process is exactly right. Oh thank heavens for AE friends - understanding support, good advice and bad jokes. Where would I be without you? Long hard day today, tramping the classrooms of east Essex and now I'm off to take Arch to football and drink disgusting coffee in the cafeteria with a kindle-full of creepiness. (Seem to have caught some nasty alliterative infection!) Yes please Dennis I'd love the story of which you speak - if it's truly no trouble. Thanks for the lively post. You're spot on about the separate skills involved. I can think of a number of writers who wrote wonderful stories and novels...but not many can do both forms equally well. ah the surprise gig! we all have them, they make life interesting! I'm sure you'll be fab - how about flash fiction, it's such a big thing nowadays - flash fiction is novel length to kids anyway! And you can get them to write group stories with discussion about the best and most powerful words to use, and what happens next... sometimes a good start for them. Good luck! Is education good for you?